What’s causing this shift and what are the benefits that freelancers should know about when accepting projects as a 1099 contractor? Are there specific qualifications and how can a freelancer apply for these benefits? There are several factors that have created the perfect environment for freelancers working under 1099 contracts. The first and most obvious includes technology advances that have made it possible for anyone to create a freelance career. Between cloud computing that puts software and information into the hands of everyone and social networks where people can connect for collaborative efforts, there are no limits to the types of freelance ideas that are out there. More people work from mobile devices, like laptops and tablet computers and cell phones. It’s common to see droves of freelancers working on their laptops in every coffee shop or outside in the fresh air of a public park. Many freelancers work from comfortable home offices where they can juggle the responsibilities of both personal life and career. ... 24% of global workers would take a 10% pay cut in order to be able to telecommute. It also showed that one-third of global workers believe work-life balance is becoming more difficult. Excessive overtime and a lack of flexibility lead more people to leave their jobs. During the recessionary period which hit the world hard in 2007 through 2010, millions of workers were displaced from their former careers. The unemployment rate, which formerly sat around 5%, doubled to over 10% by October 2009, based on data from the U.S. Bureau of Labor. With so many people out of work for extended periods of time, many turned to freelance work to make ends meet and have continued to do so successfully. As a 1099 independent contractor, there are multiple benefits. Outside of the freedom and flexibility of working on projects of one’s choice and interest, employee benefits are often available for freelancers. One area where 1099 workers can get the most support has to do with income taxes, which allow for the write off of various business expenses. The Internal Revenue Service allows U.S. self-employed individuals to claim the costs of using a home office, office equipment, computers, office supplies, fees for advertising, fees for hiring subcontractors, utilities, use of a vehicle for work purposes, and more. 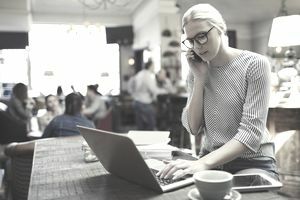 Some companies that hire freelancers have opted to offer limited benefits such as the use of a company computer, group health insurance, dental and vision coverage, access to a retirement savings plan, paid time off, educational benefits, travel and corporate discounts, and other perks. Profit sharing can be factored into 1099 work arrangements, with a certain percentage of earnings delivered when work is completed. Even if a company doesn’t offer formal benefits to contractors, there are certain advantages to being independent vs. an employee. For example, the ability to request a contract for a specified period of time is considered a plus in an age when most employees don’t even have 100% certainty they will have a job in a few months. The other advantage is that if the project ends or if there are conflicts with the company, the contractor can easily move on to another client project by ending the contract. Freelancers can also obtain benefits through freelance organizations, professional organizations, and through market exchanges. While freelancers can obtain benefits through freelance organizations, professional organizations, and market exchanges—asking about 1099 employee benefits is a good idea at the start of the working relationship. Many companies don’t advertise benefits for contractors, but they may provide limited access to their group plans. An example of this is a group supplemental insurance plan that offers low-cost access to hospital indemnity care, cancer coverage, life insurance, auto and home insurance, and pet insurance. The contractor may be able to purchase a dental and vision plan to augment a current self-employed healthcare plan. If a contractor has to travel as part of his or her duties, it’s perfectly acceptable to ask for a corporate discount or partial reimbursement for travel fees, meals, and accommodations. A 1099 contractor may be eligible for a fleet credit card to pay for gas for a work vehicle. Other costs that a contractor can negotiate for can include dry cleaning services for required clothing or uniforms, and reimbursement for required footwear or safety equipment. VISA and immigration administration and housing fees for taking a contractor role in another country can be paid for as an added benefit. Learning benefits are becoming more popular with contractors, such as being sent to industry related conferences or classes that the company pays for. It could be to earn a required certification, to maintain certification, or to improve on existing skills. While most companies reserve college tuition programs for full-time employees, contractors who work with a company for an extended period of time may be able to have some of their expenses covered for books and test fees. When negotiating a new contract, it’s reasonable to ask about potential benefits. A contractor should look at the entire relationship and responsibilities before accepting a 1099 role. If a job requires large amounts of travel, then it makes sense to request benefits in this area. If the job requires overseas work, then housing and immigration costs will be of major concern. If a job requires the use of expensive software or computer equipment, asking the company to furnish these elements makes the most sense. Bear in mind too that if you are taking a contractor job through a staffing agency, they generally have a wide variety of standard benefits to offer. You can get low-cost health insurance, supplemental insurance, life insurance, retirement savings plans, access to pay cards, training opportunities, and paid time off. The contractor should request information and apply for any benefits that he or she will need to make the career experience a positive one. Waiting until the next open enrollment period won’t be enough. Asking in advance of accepting a 1099 role is the smarter way to go. The contractor will need to complete enrollment documents just like any other employee, but the employer will designate the status as being 1099, and any premiums due from the contractor will need to be paid in advance each month.